About a month ago I interviewed Dame Alison Holst, who had just published her 100th book - her life story, with added recipes. For non-New Zealanders, Alison Holst is as famous here as Margaret Fulton in Australia, Delia in Britain or Martha in the US. 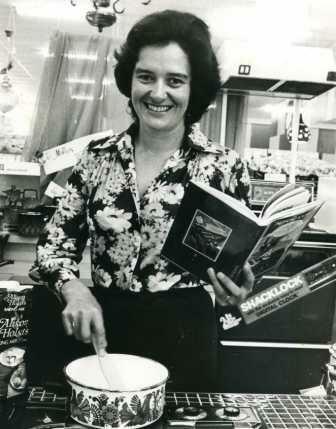 She graduated from the University of Otago in 1959 with a degree in the quaintly titled subject of 'Home Science' and was preparing for life as a teacher when suddenly she was catapulted into cooking on television. Dame Alison laughed as she told me the only advice she could find on cooking on TV was not to wear a patterned apron. Anyway, she made a meatloaf with hardboiled eggs embedded in one end of it for her audition, advising viewers that they could serve half of it hot one night and have the egg-studded remainder cold the next. The resulting show, 'Here's How', was a massive hit and Dame Alison remained a mainstay of cooking on TV here for decades afterwards, along with promoting New Zealand produce to export markets. Why have a patterned apron when you can have a patterned saucepan? She still writes a regular newspaper column with her son Simon and even though their food is hardly at the Ferran Adria end of the spectrum, they are probably the most trusted foodwriters in the country (especially among people who don't cook very much). 'Alison Holst' is regularly cited as one of the most Googled names in New Zealand and her little books on muffins or feeding children are legendary. The new book, A Home-grown Cook: The Alison Holst Story, doesn't air any dirty laundry (come on, were you really expecting 'The Mother of the Nation' to have any? ), but it does feature some of her favourite recipes. I enjoyed talking to her so much that afterwards I decided her famous Golden Christmas Cake was going to replace our usual chocolate and fig extravaganza this year. In the introduction to this recipe in the book, Dame Alison says this is the favourite cake of her great friend and equally famous New Zealand broadcaster, Sharon Crosbie. She soaks the fruit in chardonnay, but as we'd accidentally drunk the bottle in the fridge I was saving for this purpose, I used green ginger wine and added glace ginger to the fruit mixture. This cake apparently only needs a week to mature, so there's plenty of time to get down to business if you haven't got yours underway yet. This recipe is reproduced with kind permission. Put the crystallised fruit, sultanas and cranberries in a large pot. Pour over the wine and simmer, covered, for five minutes until nearly all liquid is absorbed, then leave to stand in the covered pan overnight or for eight hours to soak up remaining liquid. The fruit will have a beautiful jewel- like appearance. Stir in the quartered cherries, if using. Heat oven to 150 degrees Celsius (140C fanbake), with the rack just below the middle. Prepare a 20-centimetre square pan, or 23cm round or square pan, lining sides and base with baking paper. In a food processor or large bowl, beat the soft (but not melted) butter and sugar until creamy. Beat in one egg at a time, adding a spoonful of the ground almonds after each one. Beat in the essences, remaining ground almonds and the finely grated citrus rinds, then sift in the flour and baking powder. Combine the cake mixture and the cold, prepared fruit using your hand and spread mixture evenly in the prepared pan. Bake at 150C for 45 minutes then at 130C for 1 1/2 to two hours. Cover the top with baking paper if it browns too fast. The cake is cooked when a skewer pushed deeply in the centre comes out clean. When cooled, wrap loosely with baking paper, then refrigerate. I made ours before we moved house (for which I am now truly, truly grateful) and am planning to decorate it with more glazed crystallised fruit a la Delia in a week or two. I'll show you a picture then! I have to admit I'd never heard of Dame Alison Holst before, although her face does appear familiar. She sounds an amazing woman and what a priviledge for you to meet her. No, I've never heard of her either. But, oh boy, does that cake sound good. Never thought of soaking fruit in wine, it's usually spirits and loved that you had 'accidentally' drunk yours lol! How fascinating that I have cooked so many of her recipes and yet never seen her photo until now - I got a copy of her Vegetarian cookbook as a student and it was one of my favourites - only later did I find out that she was famous in New Zealand. Her christmas cake sounds great but I have already fallen for your chocolate and fig one and am just waiting to taste it! Dame Alison is a legend. I learnt so many of my basic cooking skills from her books; she is sort of my hero. Lovely post! Hadn't heard of her, but a very interesting post. I like the idea of a golden cake rather than the more usual dark one. Bet it'll taste great. love to read your blog..